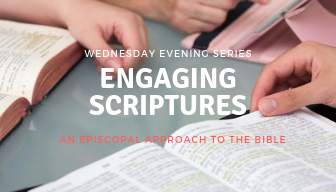 This six-week course on Wednesday evenings will explore how we as people of Redeemer / Episcopalians / Christians interact and engage with scripture. Led by the Rev. Philip H. DeVaul this course includes dinner and childcare is available. The scriptures are a gift given for building up communities. How we interact and engage with scripture is fundamental to who we are in relationship to each other, our broader community, and Jesus. As we work towards the vision of a Church that knows Jesus and grows in Love, we will return again and again to the scriptures for wisdom and guidance. The evening will begin each week with a shared catered meal (a free will offering will be taken to cover the cost of the meal) and follow with a time of teaching. After some dessert and conversation with others at our tables, we will finish up with some Q & A and a closing. As this course builds upon itself each week, we are asking that you make a commitment to attend at least 4 of the 6 sessions. If you have questions contact Phil DeVaul. Sign-up now! Thank you for registering. We look forward to exploring scripture with you.